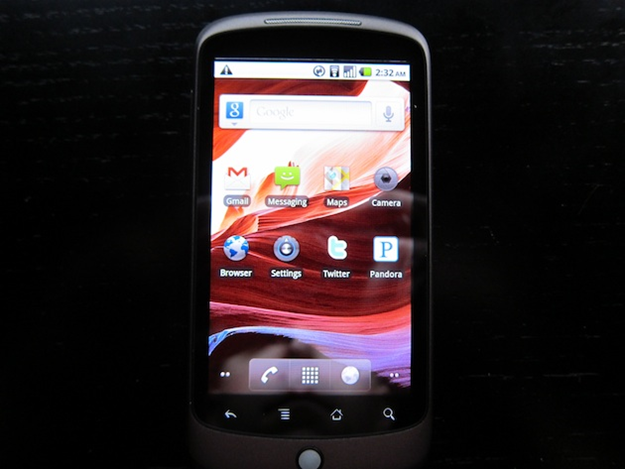 It looks like Google has started the rollout process of Froyo to the Nexus One. Go to your device's settings and have it check for updates - there is a chance that you can download it right now. MG Siegler of TechCrunch has successfully performed the update after seeing an update notification on his Nexus One and snapped the photos below. At the Google I/O conference, the only answer I could get from Android developers regarding Froyo release to the N1 was "soon". However, they hinted that it would *really* soon, and so I was very skeptical of baseless updates like this one claiming a June release date without a source to back it up. According to MG, his phone is indeed much faster, which is quite expected. So how many of you is the update available to? How must faster does it feel? Update 3:30AM PST: Google may have started with US devices, as international users in our comments are reporting not seeing the update. My only advice is be patient and hope for the speedy rollout. Update 7AM PST: From the comments around the web and in this post, it looks like almost nobody has the update yet. However, reports started surfacing from some twitter users who also claim receipt of the 2.2 update (thanks reddit). If these are true, it looks like Google started the rollout at a very slow pace, probably to see how it does in the wild. Hopefully the rate will pick up soon. Update 9:29AM CST: Chris here, I'll be updating this post from now on with any important information as I come across it. I've been following this thread on XDA-Developers for information as it develops. 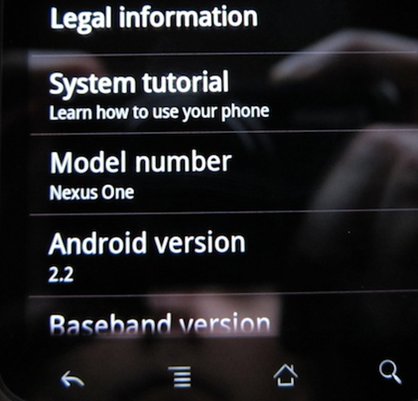 I have gone ahead and flashed my Nexus with the latest official Eclair rom from Google - ERE27. I'm not able to flash the stock recovery at the moment since I don't have access to my laptop. Fingers crossed for the update. I'll continue posting updates as the story progresses. Update 10:10AM CST: Ladies and gentlemen, this is official. While we haven't received the update ourselves, Engadget has revealed that they too have now have the Froyo OTA, thus validating TechCrunch's original post. Update 12:45PM CST: Endgadget is now reporting that they've done some "some additional investigation" and it appears that the update is only rolling out to Nexus Ones previously provided to the press. Still waiting on an official confirmation from Google. 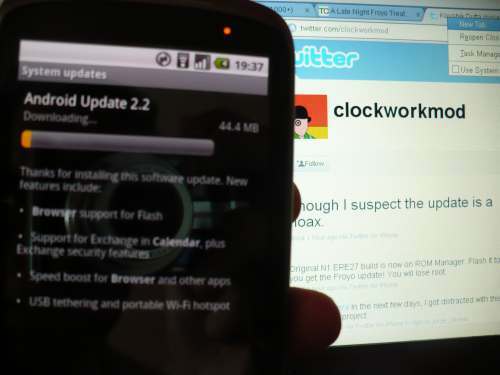 Update 1:55PM CST: Twitter user NinjaRobot has posted a fairly convincing picture of his phone downloading the 2.2 update. It's unclear at this point, but he doesn't appear to have a press phone. I've reached out to NinjaRobot for comment. Are Droid and EVO 4G up next? Who wants to take bets on the number of months it would take and which one of the two would win?